The full Bellissima Records catalogue on CD and more with lots of signed stuff! The Moon Over Montana download will be available immediately after purchase. Dispatch time for the CDs and postcards can be up to one week. The full Bellissima Records catalogue on CD and more! The downloads will be available immediately after purchase. Dispatch time for the CDs and postcard can be up to one week. 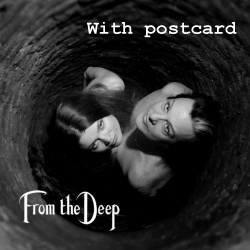 From the Deep debut album on CD with 12-page booklet and lovely From the Deep postcard! Autographed by Katharine Blake and optionally signed to your name. Dispatch time: up to one week. 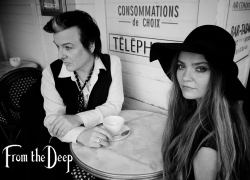 From the Deep debut album on CD with 12-page booklet. Autographed by Katharine Blake and optionally signed to your name! Dispatch time: up to one week. From the Deep debut album on CD with 12-page booklet. Dispatch time: up to one week. A beautiful From the Deep postcard with the photo and logo shown on the left on one side (logo is slightly smaller on the actual postcard) and standard postcard layout on the other side. Dispatch time: up to one week. From the Deep debut album as a super high quality download. Includes digital booklet (PDF) with all the CD album artwork and additional photos. GoMojo downloads are encoded for superior audio quality with a bit rate of up to 400/425 kbps (AAC/Ogg Vorbis). Each download is provided through a link, which will be e-mailed to you after you have made payment. You will be able to select between two formats: AAC (as used by iTunes) and Ogg Vorbis. Please click here for more information. Delivery charges for goods from the From the Deep shop vary depending on your location and the goods that you order. Total delivery charges will be shown on the order summary screen before you make payment.